Whether your home’s vinyl siding needs to be replaced or you are just tired of the way it looks, now is the perfect time to get creative with vinyl siding. In the past vinyl siding was boring and looked cheap. Today’s vinyl siding is something entirely different. It is available in a wide variety of styles and colors, ensuring your home looks distinctive, classy, and expensive, while still being affordable. If you are considering new vinyl siding, here are a few options that will allow you to show off your creative side, while also making sure your home is well protected from the elements. If you are tired of the varying shades of white, beige, and brown that you see on most homes, you may want to look at your color options. There is a complete spectrum of colors from a bold brick red that amps up your home’s visibility to a charming pale yellow. WIth plenty of hues to choose from, you are sure to find one that reflects your style and boosts your home’s curb appeal. Of course, if you do prefer a classic gray or white, those colors are still available. They can even be a great option, particularly if bright flowers are a big part of your landscaping. 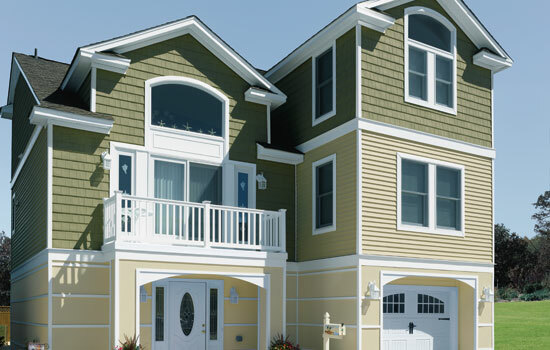 At the same time, you may find that using multiple colors of vinyl siding is the perfect way to show off your unique personality. Particularly if your home is more than one story, it allows you to accent certain sections of your home. Do you like the timeless, classic look of a cedar-clad home? Then vinyl cedar shake might be the ideal choice for you. It has an authentic wood appearance that gives your home the warm exterior you crave with the durability and resistance to rot, moisture, and termites. In addition to being available in multiple finishes and at an affordable price, vinyl cedar shake siding can be found in several different patterns, such as tongue and groove or bevel. There is no reason to go with the same size vinyl siding that every other house on your block has. Panels can range in heights from 4” to 8”. You can choose slats that are narrower, wider, or use a combination of sizes for different sections of your home. For example, alternating wide and narrow panels are especially striking. Along with mixing and matching your colors and panel sizes, using a variety of styles is a unique way to give your home a modern edge. A few options to consider are using wide vertical board and batten on your home’s upper level and a more traditional, horizontal lap siding on the bottom. The result is a home that has added visual appeal and height. If you have a Victorian-style home, mixing decorative siding styles and colors will help show off your home’s architectural appeal. For a truly unique look, add a new trim, preferably in a variety of intricate shapes, at the same time you are having your vinyl siding replaced. Just be sure to add a trim that complements your home’s style and architectural look. When done right, new vinyl siding accompanied by a new trim will instantly dress up your home. It’s time to start looking at your vinyl siding options so that you can finally have the unique, stunning home you’ve always wanted. Contact NC Siding today to see how beautiful your home can truly be.